I woke up early this morning, browsing the internet, and I suddenly thought of what entrepreneurs like me face on a daily basis. Here’s a piece of what I found. It’ll speak for itself. Have you noticed how very busy people are these days? It’s like some sort of epidemic. It’s a curse. We have only 168 hours a week. If you’re sleeping 8 hours a day means, you only left with roughly 110 hours. Within 110 hours, how many hours can you be really productive? Because we are busy: – People are working very hard, long hours in their business. Parents don’t have enough time to play with kids. We don’t have time to nurture important relationships. We don’t have the quality of life we would like. Where is being busy getting you? If everyone is so busy, surely you would expect that people are experiencing phenomenal business success, an idyllic family life and a great lifestyle. Being busy doesn’t equate to producing results. So, over the next few days just observe yourself and your “busyness”. Where is it getting you? How does it make you feel? Make a pact with yourself to reduce “busyness” and increase productivity. 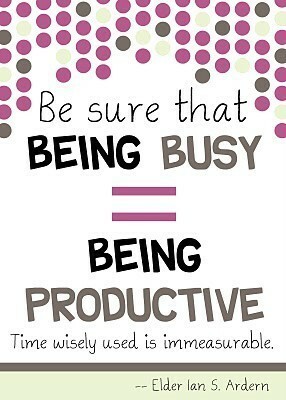 What’s your view on the impact of being permanently busy versus productive? Share and air your views.